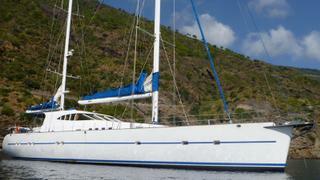 The 29.8 metre motorsailer Anna Alfa, listed for sale by Dolphin Yachts in Palma, has been sold in an in-house deal. Built in steel and aluminium by Ukranian yard Liman Yachts to an in-house design, Anna Alfa was delivered in 2005 as a ketch-rigged bluewater cruising yacht and is Bureau Veritas classed. An airy interior in light woods accommodates 10 guests in five cabins comprising a full beam master suite, two doubles and two twins, all with en suite shower facilities. Three further cabins sleep up to seven crew. A large deck saloon has comfortable seating to port on cream coloured couches while to starboard is a dining area seating up to 10 guests on a crescent-shaped settee and chairs around a high gloss table. The sheltered steering position is forward in this area, too. A special feature is the open aft deck, offering two semi-circular settees to port and starboard in front of large tables, turning the entire space into an al fresco party and dining area. On the technical side, Anna Alfa carries a 135 square metre main sail, a 200 square metre genoa plus hydraulic genoa and staysail furlers while on deck are eight Lewmar hydraulic winches. Under power, a single 408hp Caterpillar diesel engine gives her a range of 4,500 nautical miles at 11 knots. Anna Alfa was asking €850,000 with VAT paid.